Perfect sectional. I added more seats to make it a 7 seater. Absolutely the best purchase I have ever made. Soft and comfortable. Heated massaging double lounge seats are amazing. Definitely well made and durable. My teens and their many friends are always using it. Never any problems. This couch is so comfortable. We really like the heat and massage setting! Very happy with the purchase and customer service! I’m really happy we chose this couch. It’s great for entertaining and it’s very comfortable. The massage and heating features helps with my back injury. This set looks and feels great, the price is perfect for all the features that it comes with. 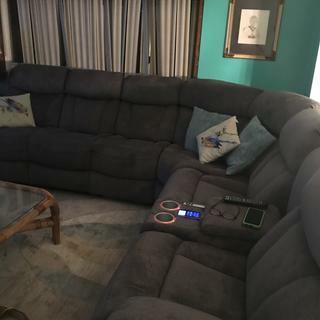 Overall I am very satisfied that I got the best sofa for the money. Its very nice. It takes some time to remember how to work controls when two people are reclining in it. The cooling effect for drinks is very loud. If i move across the country, on the west coast how does this impact my warranty and how would a service call be performed and the same question would apply if I were going to purchase an extended warranty? BEST ANSWER: Our customer care team can certainly answer any questions you have about warranty services. For assistance, please contact Customer Care at 866.383.4484.